Inspired by the recent viewing of Mary Poppins, Caiden and I rushed outside on Saturday after the streets had dried from the rain to do a bit of drawing. 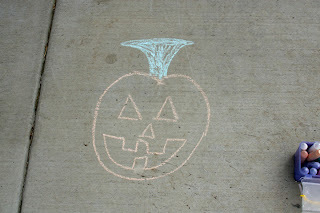 While I completely admit that I am not the best artist, I was proud of my little drawing - a pumpkin (or as Caiden has corrected me a Jack-o-lantern). I mean, you can actually tell what it is without me having to label it. 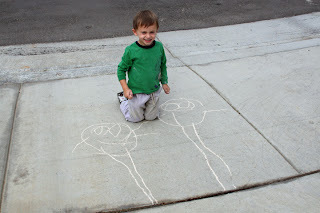 Caiden drew a picture of Dave and him. 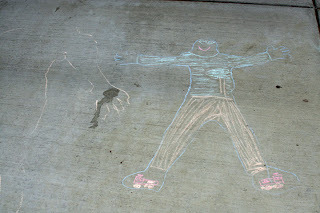 We even took turns outlining each other, and then coloring ourselves in. 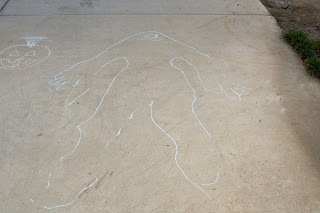 While mine didn't turn out so well (meaning the tracing that Caiden did of me), Caiden must have practiced because when Dave got home on Sunday, he let Caiden trace him.